Grunge music had pretty much run its course by 1995. Kurt Cobain was dead. Mudhoney still wasn’t famous. The Seattle sound had been replaced on the radio by up-and-comers Hootie & the Blowfish and Blues Traveler. For many, it was like the revolution hadn’t even happened. But it had, and many of those that had benefitted from the grunge explosion were ready to move on—but not without first paying tribute to their forebears. But who were these forebears? If you were to try to trace grunge music back to its source, you wouldn’t get far before running into Mike Watt. Watt was the bass player that launched a thousand other bass players. Ending every gig with words that encouraged audience members to start their own band, Watt defined punk rock in the ’80s as a member of San Pedro’s Minutemen and helped create the post-punk genre the following decade with his work in fIREHOSE. Many of the people who formed the bands that put Seattle on the map in the mid-’90s grew up idolizing Watt. As such, several jumped at the chance to help record his first post-fIREHOSE solo album. The solo record was called Ball-Hog or Tug Boat? Released in February of ’95, it featured in-studio collaborations with, among others,Henry Rollins, Flea, Thurston Moore, J Mascis, members of the Beastie Boys, Frank Black, Dave Pirner, Evan Dando, Nels Cline, Pat Smear, Dave Grohl and Eddie Vedder. With this many cooks in the kitchen, there were bound to be some hits and misses. Honestly, this record has always felt a little unfocused and inconsistent to me. I’ve always loved it as an idea, though—an attempt from those who had gained popularity in the ’90s to lend their celebrity in lifting up one they considered a legend. That’s where this live record comes in. 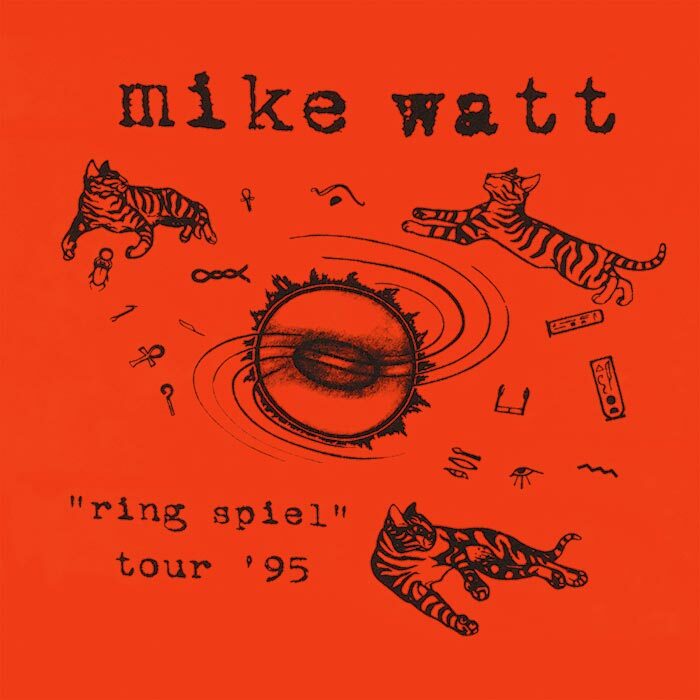 Recorded in Chicago in May of ’95, Ring Spiel captures a single energetic night of the solo tour Watt spent opening for Hovercraft and Foo Fighters. Filling out his band were Sunny Day Real Estate/early Foo Fighter drummer William Goldsmith, former Nirvana and then-current Foo Fighters members Grohl and Smear, and Pearl Jam singer Vedder. Vedder contributed some vocals, but spent most of his time onstage playing rhythm guitar. Any inconsistency I observed in the source material is quickly forgotten during this astonishing sonic time capsule. The band is raw and fired up, switching instruments and benching themselves to accommodate the different feel and shape of each song. Together, they power through a dozen and a half songs, including the Daniel Johnson cover “Walking the Cow” and the now-infamous Watt composition “Piss-Bottle Man.” Highlights include the Eddie Vedder song “Habit,” the Minutemen classic “Political Song for Michael Jackson to Sing” and a cover of Blue Öyster Cult’s “The Red and the Black.” It is a blisteringly solid performance by musicians that are almost having too much fun playing live. Is it as good as seeing Watt live today? Not even close. But for those that want to experience what it would’ve been like to see Watt lead a band of young bucks into their post-grunge music prime, this should be required listening.